Size up and sport an adorable pair of baggy shorts with rolled hems on very casual days. 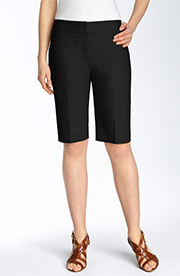 These shorts have made my top picks list several times because they are a super fit, forgiving, and flattering. Read the rave reviews. A pair of knee-length dressy shorts with a fab retro ’80s vibe. The rolled cuffs and crease provide extra polish. This high-waisted pleated style is “poufy” in an A-line silhouette, so they are quite wide and boxy. 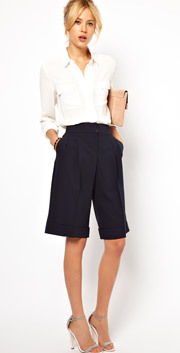 In fact, they’re almost like a hybrid between culottes and Bermuda shorts. So fun! Work appropriate for business casual environments, but just as great for a day on the town. Tuck in a top for a more streamlined look or pair them with a drapey high-low blouse or jumper for a voluminous look. Run true to size, perhaps a tad roomy. 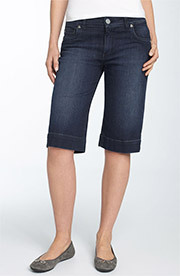 Machine washable cotton Bermuda shorts with a bit of stretch for extra comfort are an easy Summer staple. These shorts have a nice length and can be worn in a variety of ways. Add a silk tee, wedge sandals or sassy sneakers and a straw bag. Pair them with flat oxfords or slipper flats, a button-down shirt and a denim jacket or blazer. Wear them with pumps and some daytime sparkle… You may need to size up. Available in 7 sweet colours. These machine washable 100% cotton roll-up shorts are excellent. 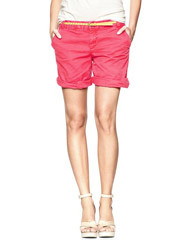 They hit at mid-thigh, fun for the beach and casual warm weather outings. They’re a loose and relaxed fit, straight through the hip and thigh. And the good news is that GAP makes these in a ton of colours. Put on a pair of cute sandals, flats, loafers or oxfords, grab your Summer tote and go have some fun! Also available in tall and petite sizes. The shorts run true to size. 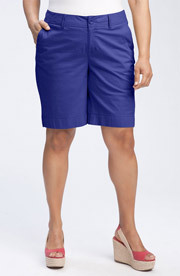 The tailored fit and great length make these bermuda shorts a versatile piece. They’re a lightweight cotton and have a bit of stretch, nice for warmer weather. The fit is quite straight and waistband adjustment might be necessary. Wear them with a blouse or shirt, pumps and a blazer. Or pair them with a high-low top, a vest, utility jacket or denim jacket. Add in oxfords, sandals or slipper flats. Grab your clutch or bag, and you’re good to go. Also available in navy, vivid lime, British khaki and neon rose. Isn’t this black and white diamond jacquard pattern delicious! 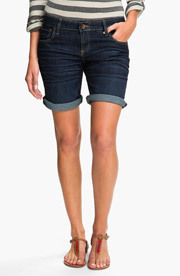 It gives these slim-fitting, above-the-knee shorts a dressy and arty vibe. Wear them to a casual office setting with pumps or slipper flats, a tailored blazer, jacket or cardigan thrown over a button-down or fab blouse. Add sassy sneakers, a cropped jumper or sweatshirt or a more casual blouse for weekend wear. Machine washable. Vince Camuto has a matching blazer, very fab if you are interested in sporting a shorts suit. I love these shorts and you can read the full review. They are comfortably stretchy and flattering. The rise comes up quite high which is fab. The legs are tapered which I find slimming. The length is perfect, and I did not need to alter the waistband. Available in black and white. 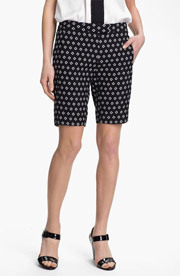 Don’t go by the picture — in person these are a great pair of dressy shorts at a super price. They’re flat front and quite flattering. Nice rise, a good length and made of soft stretchy fabric. They go up to a size 16 and I vote black just because they look dressiest in that colour. But the white and tan are sweet for more casual settings. These fit very much like the picture and are particularly good for petites. The rise is fairly high, but not what I would call high-rise. More like medium rise. Even though the style is snug against the skin, the denim is soft and comfortable. A great kick around bottom for casual Summer days. Also available for petites . Totally divine and flattering. 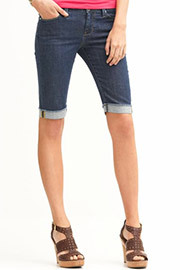 A great knee-length walk short in soft stretch denim with a reasonable length rise. Classic or funky depending on what you pair with it. Available in white too.